My first Indo-Chinese dish of Gobi Manchurian became a big hit among my family members. 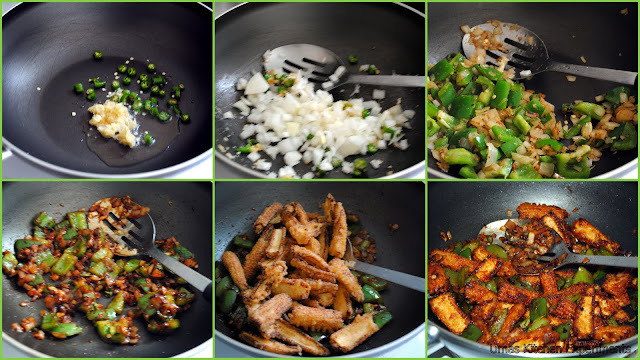 Since the preparation method is same for almost all the Manchurian recipes, I started to prepare it very frequently and also with other ingredients like Baby corn and Paneer. Today's baby corn Manchurian was very delicious which added more crispiness to the crispier baby corns. I used very less flour (very light enough to coat the baby corns) to get the crispiness. Here you go with the recipe. 1) In a mixing bowl, mix maida, cornflour, ginger garlic paste, red chilli powder and salt. 2) Add little water at a time and mix well without any lumps. 3) Beat the mix to a medium water consistency, very lightly to coat the baby corns. 4) Cut the baby corn into half and diagonally into two. This gives 4 pieces of baby corns and put them into the mixing bowl. If the baby corns very tender, diagonal cutting is alone enough. 6) Heat oil in kadai/pan and when it is hot, add baby corns slowly. 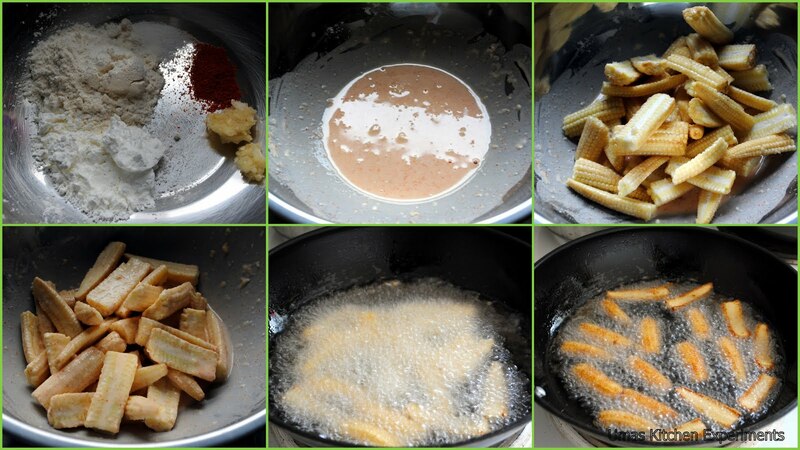 7) Fry baby corns well till they become golden brown. Medium high heat is enough. 8) Once cooked, transfer to a paper towel to absorb the excess water. 1) In a kadai/pan, heat oil. 2) When it is hot, add ginger garlic paste and green chillies. Saute them for a minute. 3) Add onions and saute them till the onions become translucent. 4) Add cubed capsicum and salt. Saute again till the capsicum becomes crispy and cooked. If required sprinkle little quantity of water to cook capsicum. 5) Add soy sauce and tomato sauce and toss well for a minute. (I have added enough green chilies and i didn't add chilli sauce). 6) Add fried baby corns and toss until the sauce coats with the baby corns. 7) Garnish with spring onions and coriander leaves. 8) Serve hot with roti or rice. I always love this Indo Chinese flavours, looks very tempting. First time here, you are doing a great job, your blog looks lovely. Super crispy manchurian...thxs for ur valuable comments.u have a nice blog....happy to follow u!! thanx for your lovely thought at my space...this baby corn manchurian looks so delicious n tempting..thanx for your pictorials...bookmarked!!! Superb pics! Manchurian was one of my first hits too!